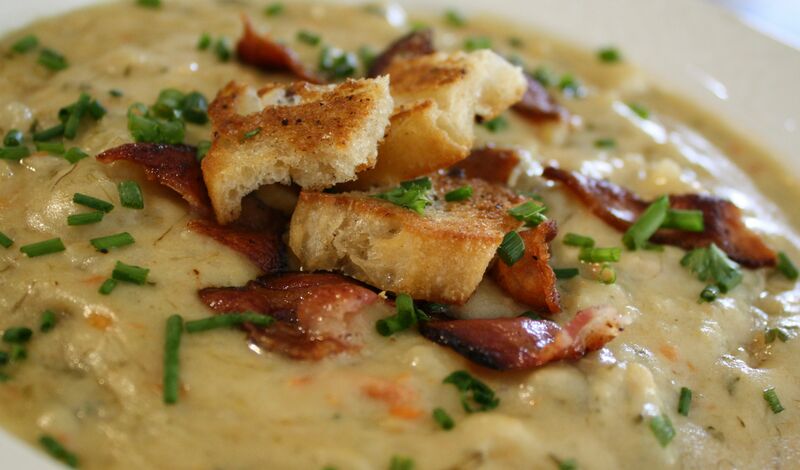 Sometimes you just need the comfort of Potato Soup. This soup is like eating a bowl of potatoes au gratin and who would pass up that. This is like the potato soup my Mum Mum used to make, but with the awesome addition of cheese and half and half instead of milk. It’s rich and creamy so a little goes a long way. Peel potatoes and dice into bite sized cubes. Slice bacon and in a stock pot cook the bacon until crisp. Remove the bacon leaving the bacon fat in the pot. Add the diced onion, salt & pepper and cook on medium for about 5 minutes. Add the garlic and cook 2 minutes more and then add just the greens from the scallions, cut up. (I save the onion part of the scallions for grilling or roasting and put them in salads) Next add potatoes, carrots and chicken stock. Cook for about 20 minutes until potatoes are tender. Next add half & half and the cheeses. Stir until cheese is melted and incorporated into soup. Add chopped parsley and most of the cooked bacon; reserving some for garnish. Give it one more stir and serve it up with a sprinkling of chives on top.